It’s showtime, as 2017’s first Full Moon Lunar Eclipse occurs in majestic Leo, the sign of the artist, player and lover. The Moon’s magical beams is about culminations, revelations and manifestations. This is a cosmic kick to push us off the cliff, and into action towards our chosen path. 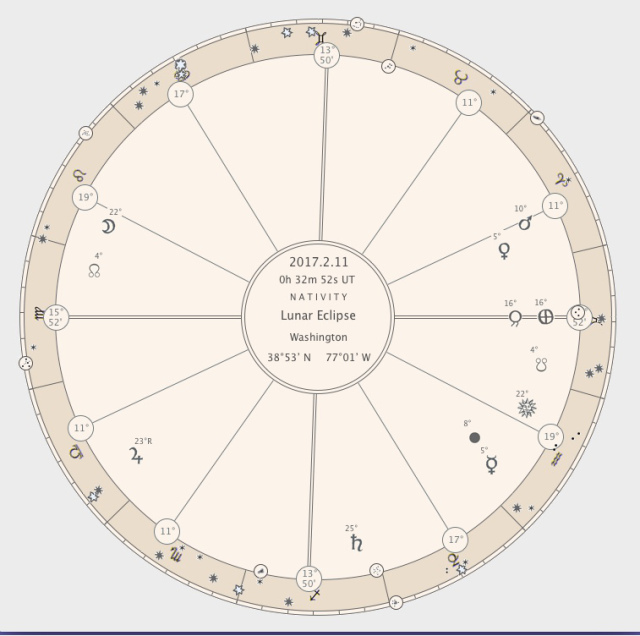 This eclipse is the first in a two-year series to hit the Leo-Aquarius axis; the Personal vs. the Universal. Sun King Leo is about finding the source of that which makes us special…one-of-a-kind. This lunation asks, How will the uniqueness that is You make a difference in the world? February 10, 2017 at 12:12 pm | Posted in Astrology | Comments Off on A Full Moon Lunar Eclipse is coming! Jupiter starts its retrograde on February 6. It’s fully retrograde on February 9. It will go direct in early June. It’s in the sign of Libra – the sign of relationships and partnerships and balance. We all may be experiencing some shake-ups with our relationships for the next couple of months. Not necessarily romantic relationships – any kind. Business partnerships, friendships, relationships within family. Any time a planet goes retrograde, it’s a good time for us to reevaluate things. The direction of things. How things are progressing (or not progressing) in that area. Buckle up for this eclipse. I’m excited — are you? We have a Leo-Aquarius polarity between the sun and the moon — the king and the fool standing on opposite sides of the court, the regal and revolutionary powers. Yet, with the moon in Leo, by rulership, this moon is happy to work with the sun. Politics are on everyone’s mind, so this amplifies the mood already at hand.